A year. A year. Up. Down. Round the bend. Round the next bend. Up. Down. Praying it’s just baby blues. It gets a little better. End up sobbing at the midwife’s office. Find yourself in a psychiatric hospital. Away from your family, away from all you know and trust. Come home more despondent and hurting than you started. Get the hope of a postpartum depression specialist. Ahhh, the right combination of medication. Find other mamas on twitter @ppdchat. Discover new depths of dispair. Wonder if there is any hope left. Bite the bullet. Ask for more help. See her make the hard, necessary choice to go to the hospital. *Please excuse the absence of Snapshot Saturdays. Please head over and pray for Ali. *Linking up with Thought Provoking Thursday. 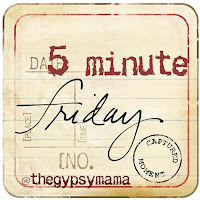 The Gypsy Mama hosts a really great blog hop on Fridays…5 Minute Friday. Here are the “rules” Wanna just write? Without wondering if it’s just right?Indulge in five rich, delicious minutes of pure writing. Tell your readers you’re linking up here and invite them to dig in too. And most importantly, go visit, read, and compliment the five minute chef who served something up right before you. I have a history of Multiple Sclerosis. I say it that way because I have been in remission for 5 years (totally awesome, Praise the Lord, I know!) But before the remission, I was really sick. Some days I even spent in a wheelchair because I could not walk. Other days I could not use my right hand as it would claw up and not move. There were lots of different things that could be wrong at anytime, so every day I did an inventory before I even got out of bed, I would move each part of my body to see if it was going to work that day. But slowly, as I got more confident in the remission, I quit testing every day. That every day testing has returned, but for a different reason. Now, because of the 9 months struggle with postpartum depression and anxiety, I have begun testing every day…how is my stress level? How is my mood? How is my response to the girls? How am I feeling? How am I reacting? You are set to be a crazy, crazy month. There is so much going on at work and in our personal lives. Please be kind and gentle to us. Please help us stay focussed on what really matters for our lives, our walk with the Lord and our family. May was an incredibly hard month. What a road it has been with the postpartum depression and subsequently the TMS treatments. I was out of work all but a few days of the month as we battled for my mental health. I will be returning to work tomorrow and am terrified. What if I fall apart again? What if it is too much again? What if the girls don’t settle back into routine? How do I introduce the new routine of mama being away all 5 days of the week now? What if I can’t pump enough milk for Patrice? May also brought me the blessing of crystalizing a God Sized Dream for our family and drawing me deep into the word of the Lord. Please Lord, allow that to continue. Please keep it on my heart to be a Mary, rather than a Martha. There are also a lot of celebrations this month, birthdays and graduations, camping to be done, fun to be had. Please Lord, work supernaturally in helping us balance it all. Please be with us each step of the way. Please help hubby and I to work together as a team, to bless each other fully. Okay, June, no more time to talk, time to do. On Fridays, the Gypsy Mama invites us to write for 5 minutes without worrying if it is just right…to just write and share. Come along and join the fun. This one has me a little stumped. I of course want to remember so much right now. The sweetness of my baby girl next to me in bed, the joy she has when nursing, the wonder of each of my girls learning so much every day. I want to remember the amazingness of this time. There are other things I am not sure how I want to remember them. If all goes as planned, I am in my final days with postpartum depression. I will finish the transcranial magnetic stimulation treatments on Wednesday. At that point I will end my journey to find the right medication, I will end the daily battle against myself. Who doesn’t want that? But another part of me wonders. What will it be like to live without this challenge? Will I just walk away from the wonderful ladies I have met through #ppdchat on twitter? Will I stop blogging about postpartum depression? What will I do with the last 9 months? Will I be able to remember these first months of Patrice’s life? Or will they be a fog of depression, anxiety and medication. What will I remember when this journey is over? How will this journey really end? Wanna just write? Without wondering if it’s just right or not. You’re welcome to play along. The rules are easy. Write your heart out for five minutes and show us what you’ve got. Tell your readers you’re linking up here and invite them to play along. Today I am pausing and taking a deep breath. It is my birthday and I am only doing what is necessary. We are keeping things very low key. I have another TMS treatment today and then we will go out to dinner as a family. I take a lot of deep breaths during the TMS treatments. There is some pain/discomfort with the pulsing. It feels like someone is poking my head and hurts in my nose. The treatment is 40 minutes, with 4 seconds of pulsing, and a 26 second break. The machine makes a chime sound before the 4 seconds of pulsing, so with the beginning of each one I take a deep breath. It helps me get past the discomfort. Do you ever need to take a deep breath to get past something? I sometimes have to take a deep breath when my kids are pushing my buttons, a deep breath before I start a run, a deep breath when I want to correct how my hubby has done something (I try not to be critical, he is amazing and does so much for our family, I don’t want to accidentally dishearten him by being a nag). Sometimes life just requires a deep breath. Tell me about those moments you have to pause and take a deep breath!